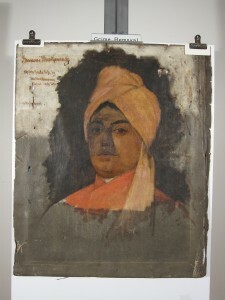 In 2009 a painting of Swami Vivekananda was acquired that is quite exceptional and rare. It was being offered on an Ebay auction. Before bidding on this painting, I needed to know if it was genuine. 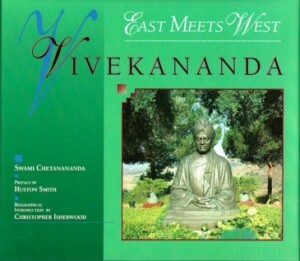 I checked the Swami Vivekananda literature, and there was no mention of the painting. So there was no confirmation there. But what was exciting was that there was no oil painting that Swami Vivekananda ever sat for, that exists today. There is a pastel drawing that was done in 1899, at Ridgely Manor, New York, by Maud Stumm. 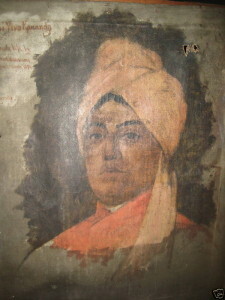 And I have seen an account that Swami Vivekananda sat for a painting in London at one point. But I do not believe that the London painting still exists. So getting back to the process of the Ebay auction., next it was checked where Swami Vivekananda was in 1894, knowing that early in the year he had been in Detroit. Historical records show that Swami Vivekananda was in Detroit from February 14th to February 22, 1894, and then again from March 9 to March 19th, 1894. He was known to have given talks in the afternoons at private homes in Detroit and then to have lectured in the evenings. Then perhaps he was again in Detroit from March 24th through March 31st. Marie Louise Burke feels that this time in Detroit was one of the most important of Swami Vivekananda’s American Mission, “almost equal in significance to that of the Parliament of Religions”. So it was confirmed that Swami Vivekananda was in Detroit in March 1894. Next, I moved my attention to the painter. It is special that the person who painted this portrait “from life” was the well-known painter John Ward Dunsmore . 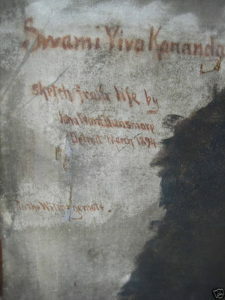 Photographs of his work were available on the internet, and I was able to compare the signature on the Swami Vivekananda portrait with another on a painting by John Ward Dunsmore. Although I am not a handwriting analysis expert, it certainly looked like the same person–the signature was almost identical. Dunsmore was a late 19th/early 20th-century painter (1856-1945) best known for his realistic and historically accurate paintings. 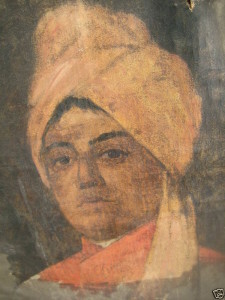 He was the founding director of the Detroit Art Museum and a member of the Sons of the Revolution. He lived and worked in Michigan, Massachusetts and France. The Fraunces Tavern Museum in New York City has a room dedicated to his rather famous paintings of the Revolutionary War.. And although I did not have a chronology of where he might have been in 1894, since he was from Detroit, it made sense that he would have been there in Detroit during Swami Vivekananda’s visit. Swami Vivekananda was gaining so much publicity at this time, literally all over the newspapers, that Mr. Dunsmore likely would have easily heard of him. John Ward Dunsmore would have been 38 at the time, some seven years older than Swami Vivekananda, who was 31 years of age in March, 1894. So there was enough that fell into place for me to feel that this painting was genuine. 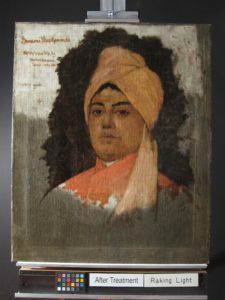 Swami Vivekananda was known to have been in Detroit at that time, the painter was a well-known Detroit based painter, and the signature on the painting matched those of others of Dunsmore’s paintings. I also want to add that the painting was in rough shape. It was obviously, from the pictures, covered with soot. It it had become detached on three sides from the original stretcher which was still there. It needed relining and cleaning etc. There were a number of old repairs and a small puncture hole in a background area. All of this made me feel more clearly that this was not a fake. Why would someone make a fake and have it be in such poor condition? It would not be worth while. My excitement was really mounting as everything came together, and I got to work in earnest relative to the bidding process. I called several friends, and they agreed to loan me some money should the auction go really high. I was prepared to bld a great deal should need be. I stayed in front of my computer on a Sunday morning excitedly watching the time tick by, When the auction finally ended I was able to win handily, for a reasonable price compared to what I felt the painting was worth. After completing the auction and paying for the painting, I asked the seller, via the internet, to tell me anything else that he would, about how he came to own the painting. He did not choose to reply and so nothing further is known to me about this. The painting measures 22 1/4 by 27 inches. Soon after acquiring it, I co rresponded about the painting with Swami Chetanananda, who from what I can tell, is the most well-respected and knowledgeable authority on Swami Vivekananda alive at the moment. I had spoken with him in the past when I had questions about Swami Vivekananda, while I was doing research for Bhagavan Adi Da. 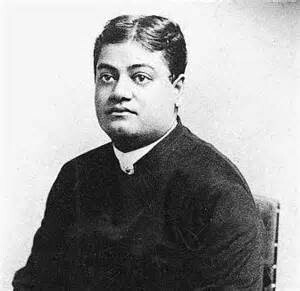 Swami And I was quite familiar with his body of writings and other words on Sri Ramakrishna and Swami Vivekananda. Swami Chetanananda expressed his interest in this new discovery and mentioned that he would be in Sacramento soon to give a seminar. He wondered if I might be able to see him there. So on a Saturday morning I drove a little over two hours to the Sacramento Vedanta Society, taking the painting with me. When Swami Chetanananda finally saw the painting he was extraordinarily moved. 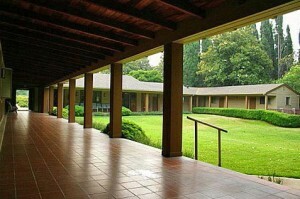 We held it up in front of him in the courtyard of the Sacramento Vedanta Society, and he stood up to view it. He did not want to stop looking at it. As he continued to stand and view the painting, tears welled up in the corners of his eyes. It became clear to me that he was having “Darshan” or the Sacred sighting of one of his Spiritual Masters. There are only 94 photographs of Swami Vivekananda in existence. And then there is that one pastel drawing of Swami Vivekananda done at Ridgely Manor. 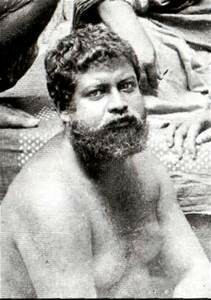 So here was another chance to see directly what Swami Vivekananda looked like. He physically sat for this portrait, likely on several occasions, and undoubtedly looked at it himself as it was being painted and then after it was completed. I told Swami Chetanananda that I was going to get the painting professionally restored and that it would likely bring out the image further. He was excited about this. He told me that when it was completed, he would like to see photographs of it. He also said that he would like to announce this new discovery by publishing an article about it in one of the Vedanta Society Publications. I contacted the Fraunces Tavern Museum in New York City, and the curator and collections manager there, Suzanne Prabucki. She was very happy to send me a great deal of information about John Ward Dunsmore, which I will add to this post perhaps at a later date. I have now had the painting restored by a fine painting restorer, Pauline Mohr, a consumate professional. Pauline was recommended to me by Adi Da’s devotee Gawain Weaver. The restoration took a full year, but at last it is done. The painting was given to be restored just days after the Valley Fire. I told Pauline to take whatever time she needed to do the very best job. Here is a photograph that graphically shows how much difference Pauline has been able to make. This is a photograph showing just one half of the face cleaned, with the other still full of dirt and soot. The picture at the top of this post is the completed restoration. Recently, I was able to solve to my satisfaction, the mystery of the inscription, “To the Witer gemote” that is written at the top. For a long time I felt that this was some family that it was being dedicated to. But research revealed that the term does not refer to a person but instead the “Witena gemote” is a term to refer to the “assembly of the wise” or I believe in its intention, to the gathered admirers and students of Swami Vivekananda. On the painting there is a blank space between the “Witer” and “gemote” writing and I believe that before the “r” might have had a descending line and was originally a “n” and then there was an “a” t fill that blank space. So that originally it was written “Witena gemote”. Alternatively, with 120 years passage of time, I think that writing “witer” instead of “witena” could just be a difference in the way that the same word is being spelled. The fact that it is described as a Victorian coinage is interesting, because this painting was painted and inscribed during Victorian times of course. witenagemot [Old Eng., = meeting of counselors], a session of the counselors (the witan) of a king in Anglo-Saxon England. Such a body existed in each of the Anglo-Saxon kingdoms. Composed of the higher churchmen, the earls, and other members of the nobility, it was aristocratic, and its membership at any one time was dependent upon the appointments of the ruling king or his immediate predecessors. The Witenagemot Old English witena  “meeting of wise men”), also known as the Witan (more properly the title of its members) was a political institution in Anglo-Saxon England which operated from before the 7th century until the 11th century. The Witenagemot was an assembly of the ruling class whose primary function was to advise the king and whose membership was composed of the most important noblemen in England, both ecclesiastic and secular. The painter, John Ward Dunsmore, later became most famous for his depictions of scenes of the American Revolution and so perhaps even at this time he was familiar with the use of the term. Altogether I prefer a more general definition where the term simply means, “assembly of the wise” (“witena” has a French origin meaning “sage” or “advisor”; “gemote” means “assembly”). So I feel that he is just dedicating the painting to those gathered around Swami Vivekananda.